Port of Grays Harbor is in Aberdeen, Washington state. There have been proposals to use the harbor to increase US coal exports to Asia. The Port was founded in 1911 near Aberdeen, Washington. Historically, the port was a leading export port for U.S. grown timber; Grays Harbor now leads the U.S. in exports of American grown soybean meal and is the number one seafood landing point in Washington State. The port maintains four terminals. The Port’s largest marine terminal, Terminal 4, is a 1400 ft. long berth capable of handling two vessels. One half hour from open sea, Gray Harbor's Terminal 3 is a 150 acre marine industrial site with a deep water terminal and on-site rail. As of late July 2011 Terminal 3 was available for sale or lease. It was reported in July 2011 that a railroad was looking at a Port of Grays Harbor terminal in Hoquiam, Washington for a terminal to ship coal to China. RailAmerica Vice President Gary Lewis told The Daily World of Aberdeen the idea would require further study and the project is several years from being completed. The possible 45 million dollar export facility would be built at Terminal 3, a former log yard. RailAmerica owns the Puget Sound and Pacific Railroad that serves Grays Harbor. The port's potential coal export terminal could bring another 75 ship calls a year to Grays Harbor. 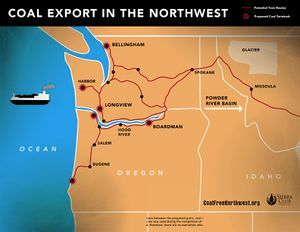 In April 2012 Oregon Governor John Kitzhaber called for an extensive federal government review of exporting coal to Asia through Northwest ports. The Governor said that coal exports could clog barge and train routes, increase diesel and coal dust pollution, and boost amounts of toxic mercury drifting back to Oregon when Asian countries burn the coal. However, Kitzhaber didn't take an explicit stand for or against exporting coal. Instead, his letter asked the federal government to address how increasing exports to Asia will "fit with the larger strategy of moving to a lower carbon future." In August 2012 it was announced that RailAmerica was canceling its plan for a coal storage and export facility at the port's Terminal 3. The company said they believed there are other uses for the terminal that are more likely to generate jobs, tax revenues and business for the port and for the company. As such plans to export coal from Grays Harbor were cancelled. ↑ "PGH Terminals" Port of Grays Harbor home site, accessed July 29, 2011. ↑ "Coal export terminal studied at Hoquiam" KBKW, accessed July 29, 2011. This page was last edited on 30 May 2015, at 01:19.